getcalc.com's Circle Calculator is an online basic geometry tool to calculate area, circumference, diameter or radius of a circle shape, in both US customary & metric (SI) units. Circle is a round plane with every point on its boundary consists of equal length from the center point. Any distance between any point on the boundary and the center is called the radius. The straight from any point to another through the the center point is called the diameter. 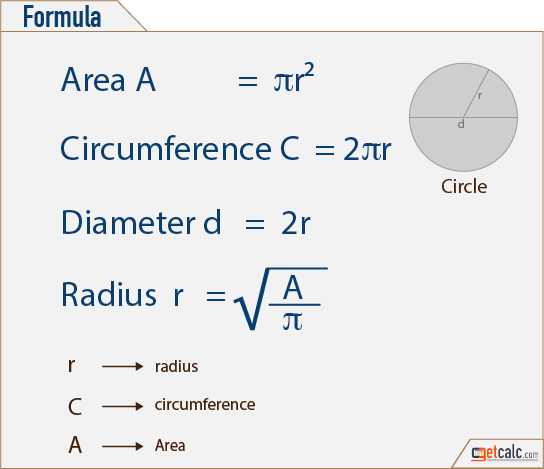 K-12 students may refer the below formulas of circle to know what are all the input parameters are being used to find the area, perimeter or radius of a circle. Below are the practice problems for grade school students, on finding what is the area, perimeter or circumference of a circle. By click on the corresponding problem shows the step-by-step calculation or work with steps for how to find the area, circumference or radius of a circle. For any other similar values, use this circle calculator to verify the results. Find what is the area of circle whose radius is 6 inches? What is the area of circle, if it has the radius of 11 inches? Find what is the circumference of circle whose radius is 42 inches? What is the perimeter of circle, if it has the radius of 54 inches? Find what is the diameter of circle whose radius is 27 inches? What is the diameter of circle, if it has the radius of 36 inches? Find what is the radius of a circle whose area is 2464 square inches? What is the radius of circle, if it has the area of 1386 square inches?